Uber has launched the Green service in Ukraine. "We start with 200 cars, completely electric, not hybrid ones. And of course, this is just the beginning. We expect that by the end of April, 10,000 Kyiv residents will take advantage of Green," a representative of the company said at a press conference devoted to the launch of the service in Kyiv on Thursday. The fare is the same as that for Uber Select: the base rate is UAH 30, UAH 1.30 per minute, UAH 4.60 per km. The minimum fare for rides in Kyiv with Green is UAH 55. 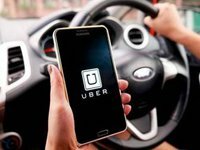 According to the company, Kyiv became the second city after Bucharest in Central and Eastern Europe, where Green was launched, and one of the few in Europe where Uber offers the option of "green mobility." "The goal of the new service is to make electric cars accessible to more people than ever before and to stimulate the development of electric vehicles. We cannot do it alone and want to develop partnerships with the authorities, automakers and other energy market players," the company's representative said. Mainly Nissan Leaf, Renault Zoe, Hyundai Ioniq, Tesla S, BMW i3, Chevrolet Volt, and Chevrolet Bolt will be available in the Green service in Kyiv.